Meet Lisa Aiken, fashion director of Moda Operandi and one of our personal style icons here at Who What Wear. Lisa is championed within the industry for setting trends and spotting new designers like it's no one's business. No really—if there's a cool new brand or rising trend, she's not only already wearing it, but has edited it into Moda Operandi's shopping selection for all to enjoy. 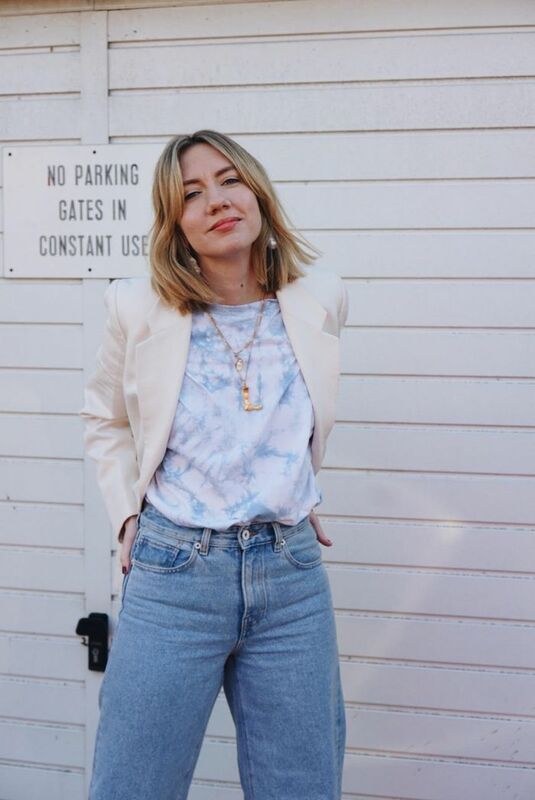 Since we're always looking to Lisa for our every next shopping move was somewhat of a regular occurrence, we're thrilled she's agreed to come to join us as a columnist on the site serving the latest and greatest when it comes to trends, style, and shopping. Today, it is with great honor and excitement that we welcome her as she discusses the trends we're seeing and will be seeing more of throughout fashion month. "Nineties grunge and surf set references aside, this trippy print was everywhere from Prada to Proenza Schouler and Ganni on the S/S 19 runways, and I have no doubt that my fellow fashion crowd will be the first to embrace this trend on the street. Unsurprisingly, the key to wearing it is all about contradiction, so try teaming a tie-dye tee with wide-leg pants, or tempering pastel shade swirls with on-trend neutrals for the most modern take." "Leopard is a neutral. Yes, we know, we know. However, fashion's love affair with animal print has been taken to the next level. From the monochromatic appeal of zebra stripes to chic printed snakeskin, we will no doubt see an abundance of print and texture outside the shows. Have no fear when it comes to styling—you can layer multiple pieces together for a head-to-toe look, or alternatively invest in an accessory like these snakeskin boots from Paris Texas." "This square-toe gives an instant cool factor to your footwear, especially when it comes to boots. This is one of Phoebe's lasting trends that she instilled in Celine devotees everywhere—where she goes, we all follow." "As a child of the '80s, the headband is a major throwback of an accessory trend for me. Was I dubious at first? Absolutely. But after a week with the style-setting Scandis for Copenhagen Fashion Week, I am converted. Use this finishing touch as an instant update for the most basic of outfits; a simple cashmere sweater and denim outfit, suddenly becomes 'a look' with the addition of a satin padded headband." "With the plummeting temperatures of New York Fashion Week, we all rely on a lineup of statement outerwear (and a lot of Uniqlo Heattech layers) to stay warm as we run between shows. This season it will be a case of the bigger, the better when it comes to our outerwear wardrobe. Keep it skinny on the bottom to really emphasize the silhouette of your puffer/trench/overcoat/Balenciaga-inspired parka." Next up, check out some of the latest street style photos from New York Fashion Week.